A factory fitted option to any Loheat dairy water heater is available to convert your water heater into a heater for washing dx bulk tanks. 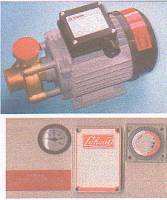 A 0.5hp hot water pump delivering 20 litres/minute @ 20psi is fitted, along with a 24 or 48 hour time clock for every day or every other day collection. This water heater is fully compliant with water bylaws and is fitted with a Type A air gap in the header tank. Just order the water heater of your required size and add a WH06 or WH061 as an extra. Remember, our prices are carriage free. Click here to be taken to our secure site to purchase your Loheat DX Water Heater online. You can also phone, fax or skype your order through to us. For standard Water Heaters, we can usually supply within seven working days from receipt of order. For non standard heaters please allow up to fourteen working days.